Now this post is kind of a continuation of my last post and a topic of its own in the same breath. Last time, I put forth my point that in today's meta game across casual and competitive formats monocolor decks are pretty much dying out or at least thats how it seems to me. Color fixing is getting easier and easier and multicolor spells are ubiquitous and usually more powerful than their monocolored counterparts, but before I go and regurgitate what I've already said, I'll get to the point. 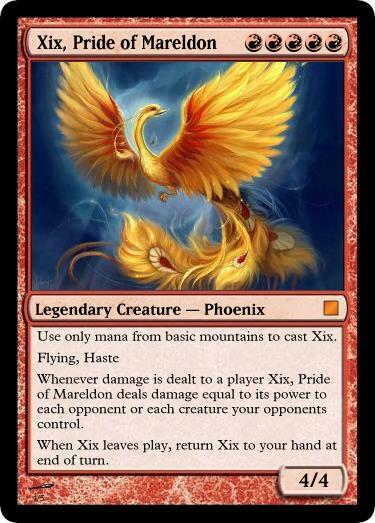 For some examples of some card design options that would give monocolored decks access to some powerful cards that multicolor decks wouldn't have access to, I designed a cycle of Legendary Creatures that are strictly for mono decks. 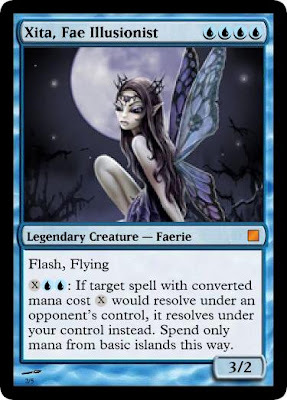 Abilities are mostly flavorful, Angels are usually attributed with flying and vigilance and planeswalkers and magical beings draw mana from the land around them for power. 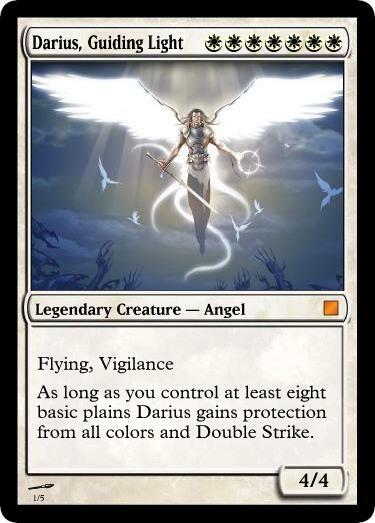 Hence the concentration of white mana makes Darius more powerful. The abilities are also inline with what White is good at: granting protection, and Double Strike is mainly a White ability (Shared with Red). 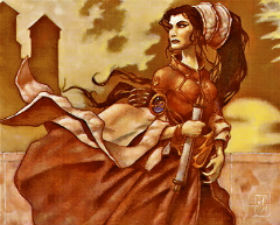 The basic plains clause restricts it to monocolor as one of the main feature of mono decks is a higher number of basics. Again the abilities and keywords here are not alien to Blue and the activated ability is again very flavorful. She's an Illusionist so when you think you're casting a spell targeting an opposing creature, she puts you under an illusion and the spell targets one of your creatures instead (or whichever creature she sees fit.). Note that I'm taking whatever a particular color is good at and pushing it over the top in terms of power. This is to reflect my view that monocolor should have the raw power while multicolor would have versatility. Again the basic clause restricts this card to mono blue. Demon with wings and no flying? Thats not very flavorful. Well if you notice, his wings have a ton of holes so he's not going to be doing much flying. He does look hella scary though so Intimidate fits. I have to say, I'm not necessarily fond of Red, but this is my favorite. Anyway, only basic mountains can be used to cast this card, again, limiting it to mono red and the abilities are very flavorful. Notice how it says damage equal to its power so perhaps voltron would be a good strategy? This one I'm the most worried that it would be overpowered. 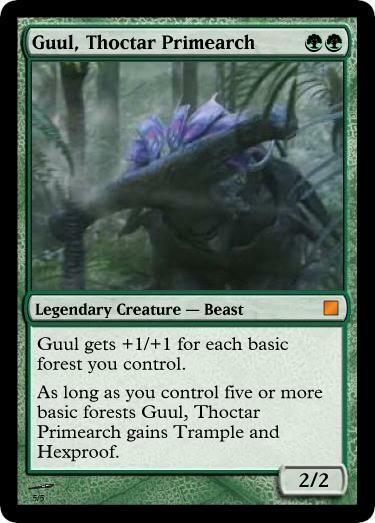 Basically a 4/4 for 2 CMC and by fifth turn or sooner since we're in green you get a 7/7 with Trample and Hexproof. But green is good at fat and ramp so this shows the raw power that green is capable of. The abilities were again flavorfully inspired. 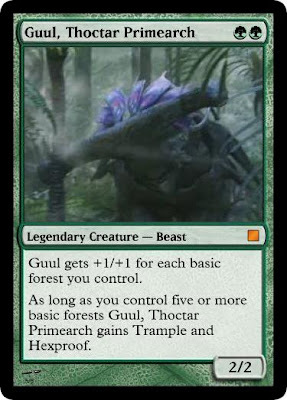 Five or more forests means dense foliage, which means it'll be hard to target anything when visibility is low, hence hexproof, and home-turf advantage in a large forest means +1/+1 and Trample. So what am I getting at? Well after designing these creatures I realized they would make great Commanders and the sheer power would actually make people want to play mono. So after discussing it with a friend we decided to create the R&D Commander format. Tired of Wizards not printing your dream commander? Do you want a legendary zombie that actually cares about other zombies? Then R&D Commander is the format for you. Now, won't people go overboard and design crazily overpowered commanders? Probably. Though, this is where playgroup policing and house rules come into play. Obviously if your playgroup votes that a Commander you have created is too strong, then you should probably scale it back a little. Though, if you like, then here are the official rules unique to this format. 1- Cards you design must follow the restrictions of the color pie. 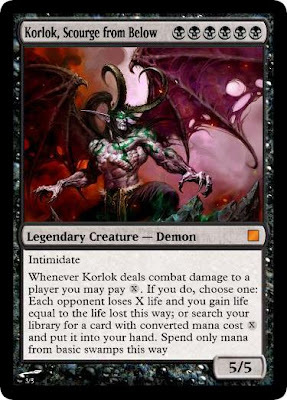 In other words, don't design a mono black card that destroys enchantments and so on and so forth. 2- If your Commander (or a another card you design) is an unblockable 7/7 for 1 CMC, that is obviously not going to work out for everyone at the table. Either create another commander or come up with a suitable drawback. Balance is what we're after here. 3- Use your common sense and try to come up with cards that are interactive and fun for everyone. Please do not purposely create degenerate combos. It is not advisable. 1- There are no altered play rules for this format of Commander. See here for standard Commander play rules. 1- You may create an original Commander for your deck as well as up to ten (10) original cards to be included in your deck in order to support any original mechanics your commander may have. As laid out in card design rules, please avoid purposely creating degenerate combos and look to create interactive and fun gameplay situations. 2- There are no other altered deck construction rules for this format of Commander. See here for standard Commander deck construction rules. 1- It is not even nearly illegal to create proxies. However, creating custom cards and selling them as real is very illegal so I take no responsibility for your actions if you choose to do so. 2- I take no credit for any of the artwork in the above cards. Credit goes to the respective owners/creators of those images. Thats all for today, and remember the point of this is not to create unstoppable cards/combos and laugh maniacally while you trounce your friends but to have fun and encourage creativity. One of the high points of this format is the fun and thrill of designing your own cards and if you decide to give this format a go then I hope that it goes well and you have fun. Remember that balancing a card can be tricky and it may take a couple games of playtesting before you find the cost for effect sweet spot. My personal advice is to look to cards that already exist for inspiration and guidance. This format was created by me (Daniel Layson), and Corey Padmore. Please leave a comment if you have any suggestions for the format or the cards that I posted, or just to let me know what you think. Thank you for reading, 'till next time. I started playing Magic: the Gathering back in 2002 during the Onslaught block and have been loving it ever since. I decided to start sharing my thoughts which led me to creating this blog. Be sure to visit some of the other blogs you see in my profile! You there! Click these links!